The Mate 20 Pro sports the same tri-camera setup as the non-Pro version, but extends the front notch. In addition to housing the camera, the notch will include facial recognition sensors, an earpiece, and possibly a notification LED. The screen size is currently unconfirmed, but the resolution is said to be 3120 x 1440. 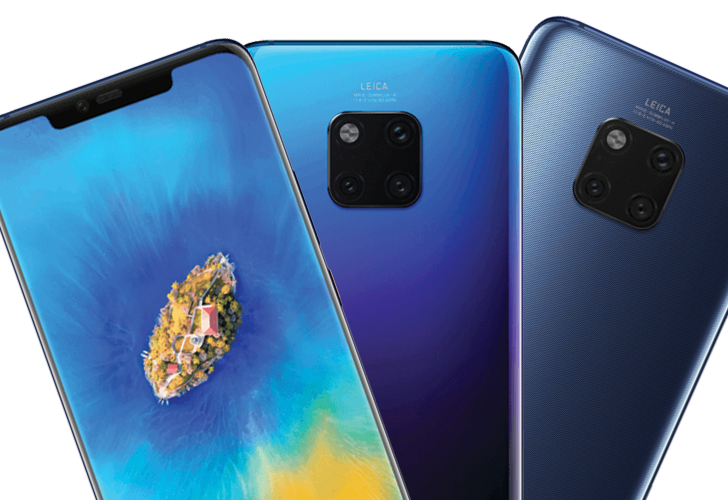 While the standard Mate 20 is depicted with a rear fingerprint sensor, the Mate 20 Pro will feature an in-display reader. The device will come in three colors: black, blue, and twilight. Significant improvements are expected in regards to the camera, now bearing a Leica logo. WinFuture reports aperture sizes from f/1.8 to f/2.4 and a 5x optical zoom. Like the Mate 20, the Pro edition will run on the Kirin 980 chipset which uses a combination of eight ARM Cortex-A55 and Cortex-A76 cores. WinFuture notes that there remains a third, unknown Mate 20 phone that we haven’t seen leak yet. This phone is codenamed Everest and is either a high-end Porsche Design edition or an even larger model. Huawei is set to announce the Mate 20 line of phones on Oct. 16th in London, but U.S. customers will likely be left out thanks to both a government ban and an investigation for violating sanctions. Evan Blass has revealed one more image of the Mate 20 Pro. It doesn't reveal anything new, but it confirms the previous leaks.